The game between sixth ranked Hoops Club (5-8) and 7th ranked Atlas F. (4-10) in Beirut on Friday ended with biggest points difference. Hoops Club beat guests from Zahle 87-73. American point guard Willie Warren (193-89, college: Oklahoma) orchestrated the victory by scoring 35 points (!!!) and 6 assists. Ali Mansour (-98) contributed with 16 points, 8 rebounds and 6 assists for the winners. Hoops Club's coach Jad El Hajj used a ten-player rotation which allowed the starters a little rest for the next games. American power forward Darian Townes (208-84, college: Arkansas) answered with 18 points, 6 rebounds and 5 assists for Atlas F.Newly promoted Hoops Club maintains sixth place with 5-8 record. Atlas F. at the other side, also newcomer in the league, keeps the seventh position with ten games lost. They share it with Moutahed. Another exciting game was a derby match between two teams from Beirut: Homentmen (#3) and Sagesse (#9). Homentmen (11-3) won against visiting Sagesse (1-12) 89-82. Nigerian-American guard Michael Efevberha (193-84, college: CS Northridge, agency: Octagon Europe) stepped up and scored 23 points for the winners and Walter Hodge chipped in 17 points and 6 assists. American guard Ramel Curry (191-80, college: CSU Bakersfield) responded with 24 points, 8 rebounds and 4 assists. Both coaches used bench players and allowed the starting five to rest. Defending champion keeps a position of league leader, which they share with Champville. Sagesse lost eleventh consecutive game. They stay at the bottom place with 12 games lost. Homentmen's supporters look forward to an exciting derby game next round, where their team will travel locally in Beirut to the arena Beirut Club. In the last game of round 17 Moutahed was beaten by Byblos on the road 84-76. 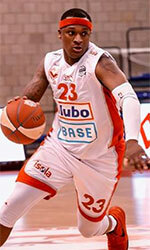 The most impressive performance of 17th round was 27 points, 19 rebounds and 4 assists by Aaron Nelson of Byblos. Another exciting game was a derby match between two teams from Beirut: Homentmen (#3) and Sagesse (#9). Homentmen (11-3) won against visiting Sagesse (1-12) 89-82. Nigerian-American guard Michael Efevberha (193-84, college: CS Northridge, agency: Octagon Europe) stepped up and scored 23 points for the winners and U.S. Virgin Islands-Puerto Rican point guard Walter Hodge (183-86, college: Florida) chipped in 17 points and 6 assists. American guard Ramel Curry (191-80, college: CSU Bakersfield) responded with 24 points, 8 rebounds and 4 assists and Canadian power forward Keanau Post (211-92, college: Missouri, agency: Slash Sports) produced a double-double by scoring 14 points and 10 rebounds. Both teams had four players each who scored in double figures. Both coaches used bench players and allowed the starting five to rest. Defending champion keeps a position of league leader, which they share with Champville. Sagesse lost eleventh consecutive game. They stay at the bottom place with 12 games lost. Homentmen's supporters look forward to an exciting derby game next round, where their team will travel locally in Beirut to the arena Beirut Club. The game between sixth ranked Hoops Club (5-8) and 7th ranked Atlas F. (4-10) in Beirut on Friday ended with biggest points difference. Hoops Club beat guests from Zahle 87-73. American point guard Willie Warren (193-89, college: Oklahoma) orchestrated the victory by scoring 35 points (!!!) and 6 assists. Ali Mansour (-98) contributed with 16 points, 8 rebounds and 6 assists for the winners. Hoops Club's coach Jad El Hajj used a ten-player rotation which allowed the starters a little rest for the next games. 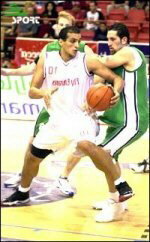 American power forward Darian Townes (208-84, college: Arkansas) answered with 18 points, 6 rebounds and 5 assists and the other American import guard Ghassan Nehme (190, college: Fair Dickinson) added 19 points and 5 rebounds in the effort for Atlas F.Newly promoted Hoops Club maintains sixth place with 5-8 record. Atlas F. at the other side, also newcomer in the league, keeps the seventh position with ten games lost. They share it with Moutahed. The game between closely ranked teams ended with sixth ranked Byblos' (6-9) home victory over 7th ranked Al Moutahed (4-10) 84-76. Byblos made 24-of-26 charity shots (92.3 percent) during the game. Byblos outrebounded Al Moutahed 37-20 including a 34-13 advantage in defensive rebounds. American forward Aaron Nelson (205-91, college: S.Indiana) stepped up with a double-double by scoring 27 points, 19 rebounds and 4 assists (was perfect 11-for-11 from the free throw line !!!) for the winners and his fellow American import forward Malcolm Riley (196-93, college: Texas Southern) chipped in 28 points and 5 rebounds (was perfect 7-for-7 from the free throw line). American point guard Marvelle Harris (196-93, college: Fresno St., agency: Slash Sports) responded with 22 points, 6 rebounds and 5 assists and guard Jimmy Salem (190-95) scored 13 points and 4 steals. Byblos moved-up to fifth place. Al Moutahed at the other side keeps the seventh position with ten games lost. They share it with Atlas F..